The stunning Domaine Chapelle is situated in the upper village of Santenay-le-Haut, and commands impressive views over the vines that slope down onto the plain below. In 2009, Domaine Chapelle became certified as an Organic Winegrower by Qualité France in recognition of the environmentally respectful way in which the vines are cultivated, and the wine is made. The winery has 20ha of vines, spread from the Côtes de Nuits region in the north, down through the Côtes de Beaune region to Santenay, enabling Domaine Chapelle to offer an impressive range of quality red and white wines. These include wines such as Gevrey-Chambertin, Ladoix, Pommard, Volnay, Meursault, and several Premier Cru’s from Aloxe-Corton, Chassagne-Montrachet, and of course Santenay, as well as some regional Burgundy wines and Bourgogne Aligoté, a refreshing, light white wine to be enjoyed by itself or often mixed with crème de cassis to make the famous Kir. Over the years, Domaine Chapelle has received many accolades and praise from the leading wine guides and competitions. For example, the Santenay Saint Jean white wine was selected for the 2018 Hachette organic wine guide, and the winery's Chassagne Montrachet Morgeot Premier Cru and Santeany Les Gravières Premier Cru white wines were picked for the 2019 Hacehtte organic wine guide, both with a star. The winery won a silver medal for their Santenay Beaurepaire Premier Cru 2015 red wine at the 2018 Millésime Bio organic wine fair. At Domaine Chapelle you have the choice of adopting pinot noir vines to make red wine or chardonnay to make white wine. Adopt a vine at Domaine Chapelle and get involved in making your own wine with the Gourmet Odyssey Wine Experience. Home to many of France’s very finest wines, the picturesque Burgundy winegrowing region is made up of a patchwork of small vineyards. The region has two main grape varieties; chardonnay for the white wines, and the famous pinot noir for the red wines. 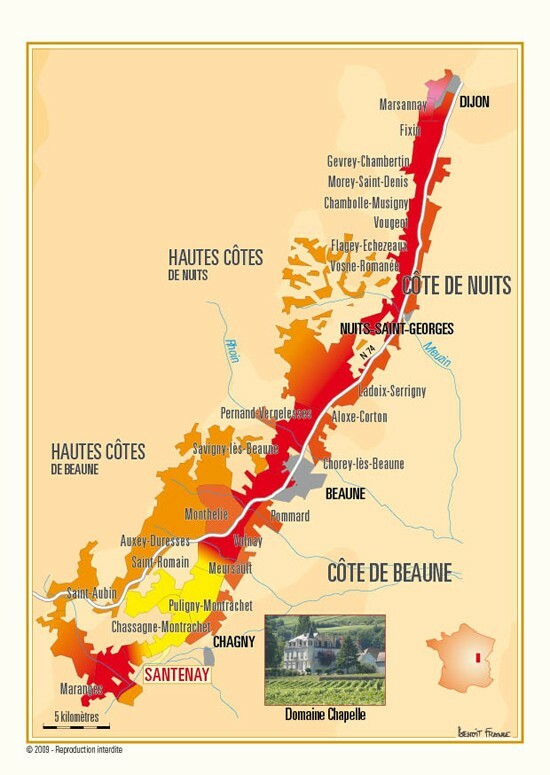 Terroir is all important, and the position of the maze of walled vineyards spreading in and around the villages, dictates which grapes will become Grand Cru, Village or Regional wines. Thirteen miles (21 km), southwest of Burgundy’s wine capital, Beaune, lies the Roman bath village of Santenay. Here, the majority of the vineyards are planted with grow pinot noir grapes, but the higher slopes are being planted more and more with Chardonnay. The red wines of Santenay are well structured and finely balanced. The whites have mineral undertones. Since 1893, the Chapelle family has put all their energy into producing exceptional wines that express their terroir. This winery has often been one of the region’s pioneers. Jean-François' great uncle was one of those that fought for the recognition of the Appellation d’Origine Contrôlée system for classifying wines. His father was one of the first Santeany winemakers to sell all of his wine directly, and in 2006, Jean-François was the first Santenay winemaker to convert the totality of his vines to being organically certified. 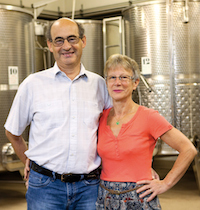 Jean-François and his wife, Yvette have been running the family winery since 1991. In 2001, they hired Yannick Jacrot as their Technical Director to help them in their transition towards being organic. Yannick has been an integral part of the team ever since. In 2015, their son, Simon, joined the winery having finished his winemaking studies. The next generation is now in place to continue the adventure!. For the white Wine Experience at Domaine Chapelle, Gourmet Odyssey has chosen their Santenay Village organic white wine. This is a zesty and mineral wine with floral and citrus aromas that has a nice long and well-balanced finish. The wine is made using the grapes from two vineyards close by to the winery. The Sous la Roche plot is located just above the Beaurepaire Premier Cru vineyard, and the other plot is the Les Crais vineyard, just below the château. The first has a very stony limestone soil and is on a sharp slope. The second is where the adopted vines are located and the soil has a sandly lime clay form. The wine's taste and structure benefits from these two differing types of terroir. The grapes are all harvested manually, pressed and then aged in oak barrels for 10 to 14 months. No more than 30% new oak is used to keep the freshness and balance of the wine. The wine is bottled 10-14 months after the harvest. Lyon Saint-Exupéry is the closest airport to Santenay, 107 miles / 172 km away. By car, the route takes about 1 hour and 50 minutes, and is mainly by motorway. Several major airlines fly into Lyon, such as Aer Lingus, Air France, BMI, British Airways and EasyJet. The distances and times below are estimated using GoogleMaps from the city centre to Domaine Chapelle, 2 rue des Petits Sentiers, 21590 Santenay. 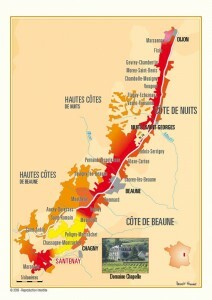 Beaune – Visit the medieval walled city of Beaune, the capital of Burgundy wines. This beautiful city is home to the famous Hospices de Beaune with its multicoloured roof. Gastronomy – Burgundy isn’t just famous for its wine. Mustard, boeuf bourguignon, snails, blackcurrants, epoisse cheese, honey and truffles are just some of the regions specialities to be savoured! We are delighted to announce that we have a new adopt-a-vine experience for white wine lovers. 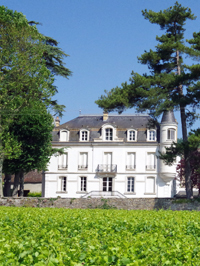 Domaine Chapelle, located in the charming Burgundy village of Santenay, has made their Les Crais vineyard available for the clients of Gourmet Odyssey. The chardonnay grapes from this vineyard are used to make the winery’s excellent organic Santenay Village white wine. Domaine Chapelle was the first winery to sign up with Gourmet Odyssey back in 2009 when we created the Wine Experience concept. Since then hundreds of happy customers have adopted pinot noir vines in the adjacent Clos des Cornières vineyard and followed the making of their own personalised bottles of wine. The same experience is now possible for those who prefer their chardonnay to pinot noir! Follow the key stages in making wine from the work in the vineyard to the work in the cellar to age and bottle the wines through the newsletters written by Jean-François, the winemaker. And for those who want to get more involved, join us for one or more of the hands-on wine course days at the winery to prune the vines, learn about how to produce the best possible grapes at harvest time, participate in the harvest, or taste wines direct from the barrel to monitor their progression though the ageing process. We’ll also be able to compare the differences between making red and white wines. We’re very excited about this latest addition to the Gourmet Odyssey Wine Experience and hope to welcome you soon!